There really isn’t anything quite like homemade butter (especially during the pasture season when the cream has a rich golden color and a wonderful flavor). Butter is easy to make with a food processor or just a quart jar. It’s a magical process where a long-lasting solid food emerges from a perishable liquid without the addition of cultures, enzymes or heat. Just a whole lot are shaken’ going on! 1. The cream should be at refrigerator temperature, < 40°F. 2. Use the chopping blade of the processor and fill it no higher than halfway. 3. Start the processor and stand by to monitor your butter's progression. Over a period of several minutes, the cream will go from being liquid to gradually becoming more firmly whipped. (You can stop it here if you're making waffles.) Grains of butter will slowly develop, but the process of turning from whipped cream into a mixture of buttermilk and butter is remarkably sudden. This is the most important step in making butter. Excessive churning after the butter has separated will make it greasy and hard to shape. Too little churning will cause the butter spoil quickly due the trapped buttermilk it still contains. With our 2 quart food processor and a 1 quart batch of cream, it takes < 10 seconds of additional running time after the major butter separation occurs. 4. Empty the processor into a stainless sieve. If you like fresh buttermilk, now is the time to save it. Rinse the butter in the sieve with cold water while working the butter with your hands to remove excess buttermilk. Keep working the butter until the rinse water is clear and the butterball is consolidated and well squeezed out. If you want salted butter, sprinkle salt and work it in evenly after it's been fully rinsed. 5.Your final product should be free of water droplets and be able to handle room temperature in a covered container without going bad for several days. The old-fashioned way! This is a fun project to do with children. 1. Fill the container halfway with 50°F to 60°F cream. Some people put a well cleaned object like a marble in the container to speed the churning process. 2. Shake (and shake and shake and shake…) It’s not necessary to be particularly vigorous, just determined. 3. The same process will occur as described in #3 above. However, it will be more gradual. Take note of the previous caution about over or under churning. 4. Finish as described above. Cultured butter: Mix in a tablespoon of yogurt (it has to be a living yogurt like Seven Stars Farm Yogurt) to your cream and let it sit at room temperature overnight. You can play with the amount of tartness by varying the incubation time. Chill well before making butter. 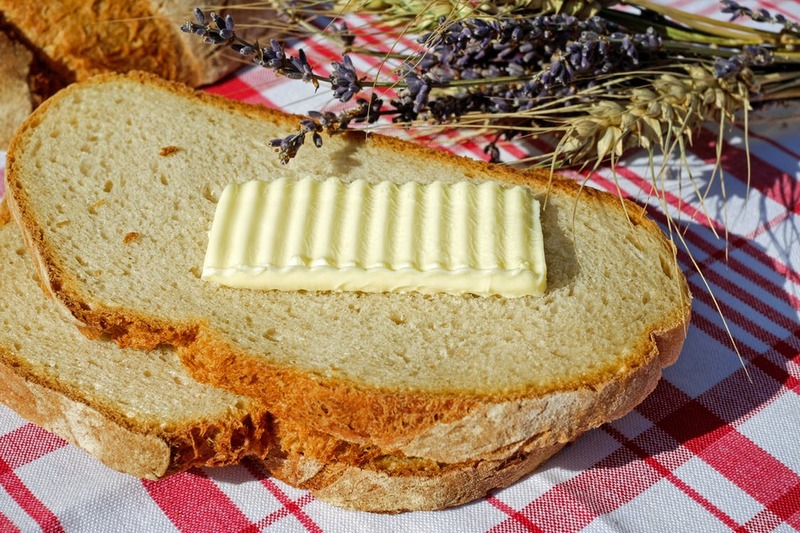 A note on cleanliness: The secret to great tasting, long-lasting butter is good cream and scrupulous attention to cleanliness. Butter freezes well. Our friends and relatives love the gift of homemade butter. 1 quart of cream will make about three quarters of a pound of butter.